Name: Pluto is named after the Roman God of the Underworld and judge of the dead. Hades is the Greek equivalent. As king of the Underworld, who do you think he has for a faithful companion? Yes, man’s best friend, a dog. But this being the hellish underworld, Cerberus is no ordinary dog. He’s a gigantic three headed monster (remember Fluffy from Harry Potter?) who guards the gates and prevents the dead from leaving. 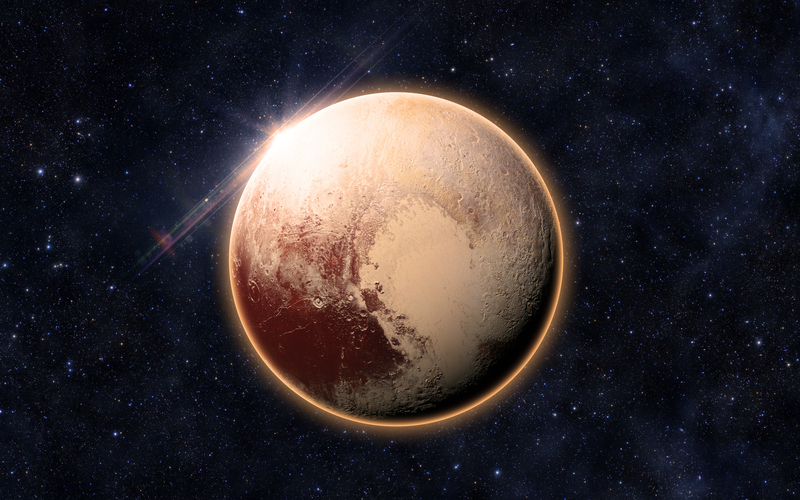 Fun Pluto Facts: The planet was only discovered in 1930 by the American astronomer Clyde Tombaugh. Venetia Burney, an 11 year old English girl won an international contest to name the planet. Pluto keeps the tradition of naming the planets after the Roman Gods. It also seemed a good name for such a faraway and mysterious planet! On July 14, 2015, Nasa’s New Horizons probe did the first ever flyby of the mysterious planet Pluto. Thanks to all new images sent back, scientists know a lot more. For instance, Pluto has huge ice mountains and vast glaciers. One big surprise…Pluto has a blue sky, just like our Earth! Pluto has five moons. One large one named Charon and four smaller ones named, Styx, Nix, Kerberos and Hydra. Unlike the nearby gas giants, Pluto is a small rocky planetoid, covered in ice. You could actually stand on its surface. But you’d need to wrap up, it’s seriously freezing there! Pluto is also the star of Amelia’s Amazing Space Adventures, my children’s space adventure series. Uglesnoo is a cute friendly alien from Pluto. On earth he ends up becoming a present. A present that’s not a present! Uglesnoo desperately needs help, as his sister is very sick. Can Amelia help him? Should she venture into outer space? Next post: My next few posts will be about best books for children and fun activities for children. After that, I’ll be back with some fun facts about the constellations, meteors, comets and other galaxies! Evonne Blanchard is the author of, Amelia, the Moochins and the Sapphire Palace, Amelia, the Venutons and the Golden Cage and Amelia, the Merballs and the Emerald Cannon. These are the first three books in, Amelia’s Amazing Space Adventures, an exciting series of ten books set in outer space (for children ages 6-10).